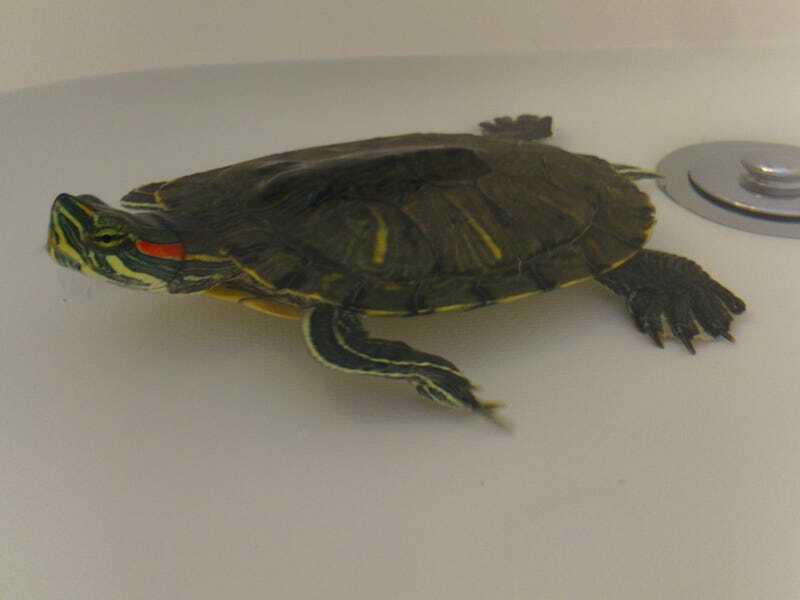 Quiero presentarle Herman, the red-eared slider. His natural habitat is Mrs. Lockyer's fourth grade classroom, but he's spending summer vacation next to my sink. He's eight years old, and RIDICULOUSLY alert and active. I was looking through the tub of turtle care products he came with, and when I picked up the turtle treat jar he went crazy splashing and throwing himself up against the glass. If you come near, he'll rush over to watch what you're doing, and clamber up onto his rock to get some attention. He thinks the dogs are pretty interesting, and Milo returns the favor. They'll go nose to nose at the glass, but R.B. isn't nearly as sanguine. He pissed EVERYWHERE the first time I picked Herman up. He is a weirdo. So, this is how he's living now. Since he's such an awesome turtle, I want to jazz his tank up a little. Any recommendations? Seriously, this guy is so friendly that when I come in for a 2 AM snack he's immediately like *splash splash splash* whassup?